My original pin showed some mason jar terrariums. I also had a recent Better Homes and Gardens magazine feature terraria. 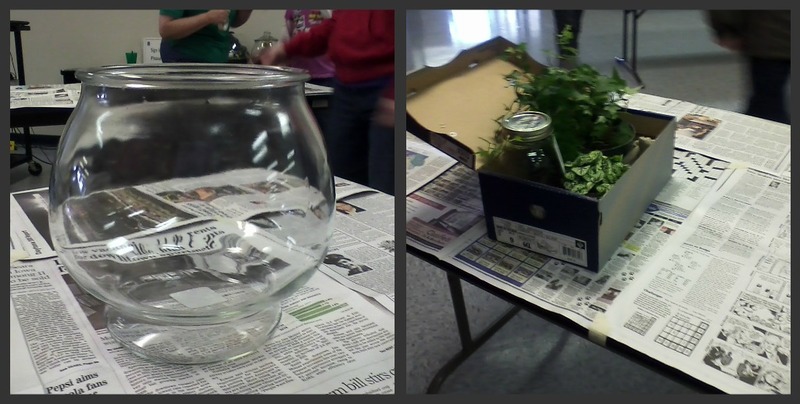 My youngest is in 4-H, and had a terrarium workshop come up this weekend, so we participated. add soil and plants, add water, then you're done! TJMaxx and Marshall’s have home dec shelves full of cheap potential glass containers. Because supplies like charcoal and rocks come in large quantities, it makes sense to me that you should make many terrariums at one time. Think of people could receive a terrarium for a gift, or other people who might like to make their own alongside you before making any purchases. Consider splitting “babies” off of larger potted plants. Individual terrarium plants cost $3 or $4 each; stressed plants at my local Lowe’s store cost $3. We divided our English Ivy between the original pot and two terraria. Moss comes dry in a bag. Someone found moss and lichen near the artificial fruit in Michael’s floral department. the difference between caring for closed and open terraria. “I” of GAIN had an open one, I have a closed one. whether terraria can survive in my house. I moved into this house with several houseplants, to discover that we get sunlight only in the early morning. The house is very shaded by the overhang on the west, and there are no windows on the south except in the garage (which makes a nice cold frame). whether a new mason jar lid works. I don’t know why it wouldn’t, but I’ve seen pins for old lids only. Do you have houseplants or a terrarium? This entry was posted in crafting and tagged terrarium. Bookmark the permalink.